Atlet’s advanced ergonomic design on the double pallet stacker include a unique power-assisted mini steering wheel and fully adjustable armrest, seat, and floor. 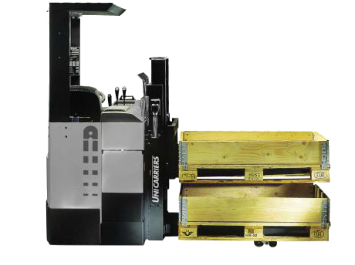 This pallet stacker forklift is designed to fit each individual operator; therefore increasing comfort and pallet handling productivity. The XML double pallet stacker’s productivity enhancing features include a fully protected chassis and excellent view of pallet loads for safe and precise handling. The Ergo XML is a fast and efficient sit-on double pallet stacker built for intensive materials handling. It allows the forklift operator to drive long distances while working in tight and narrow aisles. ATC truck computer with PIN code access for onboard diagnostics, optimum performance settings and prevention of unauthorized use.